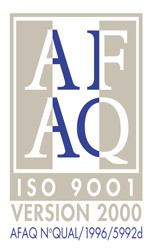 ISO 9001 V2000 certification (AFAQ N° QUAL/1996/5992e). As we take security very seriously, we transmit our own AMS (Automatic Manifest System) which allows us to improve our control of information and the timely loading of containers at ports of origin. We have volunteered to participate in the C-TPAT program. As a certified member, we follow security procedures as requested by U.S. Administration. By using TRANSO®, you benefit from our careful selection of warehousing facilities, truckers and other partners. Last but not least, our Management and our teams are dedicated to giving you entire satisfaction. 1988 TRANSO USA Washington D.C.
Information technology integrity maintained to protect data.